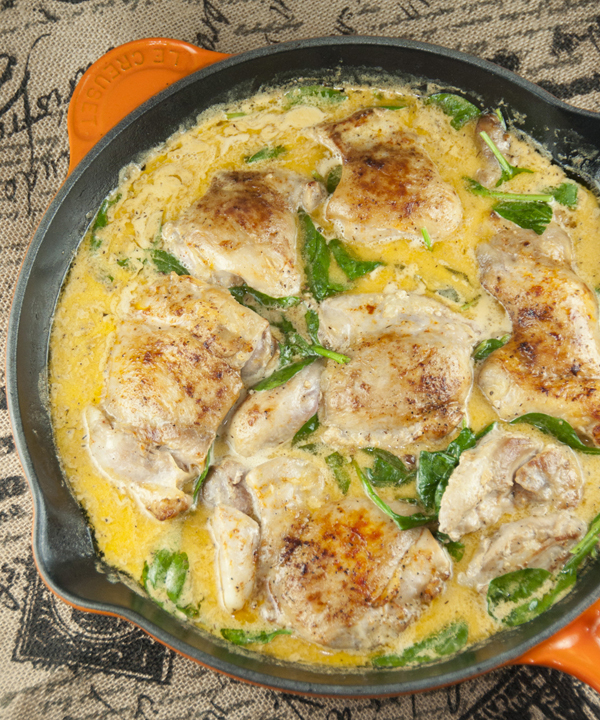 Easy, one skillet dinner recipe idea for tender chicken thighs with the creamy lemon butter sauce poured all over the top. The delicious sauce is the star of this dish! Season chicken thighs with paprika and enough salt and pepper, to taste. Melt 2 tablespoons butter in a large oven-proof skillet over medium high heat. Add chicken and sear both sides until golden brown, about 2-3 minutes per side; drain excess fat and set aside. Melt remaining 2 tablespoons butter in the skillet. Add garlic, and cook, stirring frequently, until fragrant, about 1-2 minutes (do not let it burn). Stir in chicken broth, heavy cream, Parmesan, lemon juice and thyme. Bring to a boil; reduce heat, stir in spinach, and simmer until the spinach has wilted and the sauce has slightly thickened, about 5 minutes (you don't want the spinach to wilt too much). Return chicken thighs to the skillet. Serve immediately by placing chicken on plates and spooning sauce over it. Enjoy!